A PTSD suffering soldier is assigned the task of guarding a wealthy businessman's wife and young son. Winocour's disdain for plot in favour of tension (much of it sexual) and atmosphere building is refreshing, particularly when so deftly handled. This is a filmmaker of abundant potential. If Disney paid attention to world cinema, Winocour would no doubt find herself offered a Marvel movie. Is there any other film industry that can claim to rival that of France when it comes to boasting an abundance of high profile women filmmakers? It could be argued that of France's current crop of young auteurs, it's the women - Mia Hansen Love (Eden), Rebecca Zlotowski (Grand Central), Celine Sciamma (Girlhood), Lucie Borleteau (Fidelio: Alice's Journey) - who are producing the most interesting work. And they've not been ghettoised either. Directors like Zlotowski and Claire Denis (Bastards) are allowed craft dark, atmospheric dramas while their Anglo-Saxon counterparts are all too often saddled with generic rom-coms and biopics. Alice Winocour, currently winning acclaim in her role as screenwriter of the Turkish set feminist drama Mustang, continues this refusal to allow her gender be pigeon holed by delivering a tough action movie in Disorder, which contains scenes of violence that will have the most machismo of male audience members wincing. Europe's male star of the moment, Matthias Schoenaerts headlines as Vincent, a soldier newly returned to France from a tour in an unnamed Middle Eastern country. He's brought back a particular brand of PTSD which badly affects his hearing in one ear, while enhancing it in the other (making him something of a gritty take on Marvel's blind hero Daredevil). While on leave, Vincent makes some extra cash working alongside his soldier buddies on security assignments, the latest of which involves policing a shindig at the plush home of a wealthy Lebanese businessman. 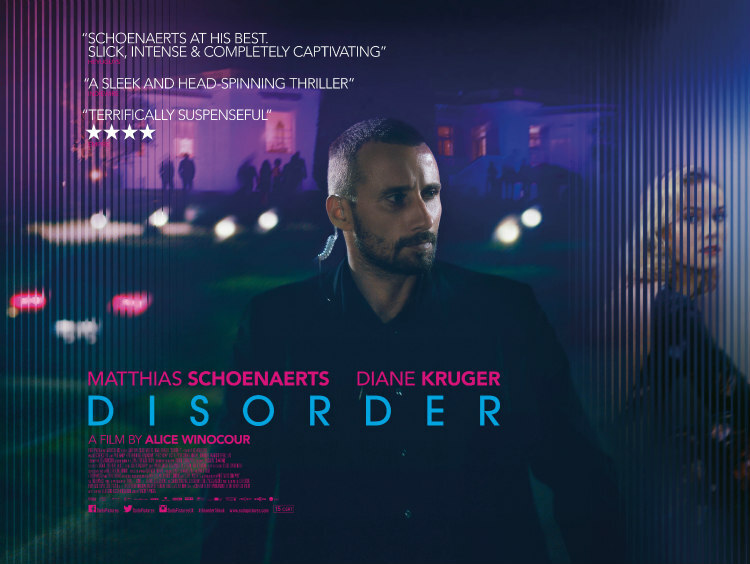 Patrolling the grounds, Vincent is struck by the man's attractive German wife, Jessie (Diane Kruger), showing a thorough lack of professional ethics by effectively stalking her, both in person and through the mansion's many surveillance cameras. The following morning Vincent is asked if he fancies sticking around to keep an eye on Jessie and her young son while her husband takes a business trip, and wouldn't you know, he's perfectly eager to spend time around the object of his unethical lust. Vincent soon discovers this is no easy task, as Jessie and the boy find themselves targeted by a mysterious group intent on kidnapping the pair. Schoenaerts has managed to do what few continental actors have in the past in breaking out into English language cinema, but if you've only seen him in the roles where he's been typecast as a shy, sensitive love interest (A Bigger Splash, Far from the Madding Crowd, A Little Chaos), you haven't seen the Belgian at his best. Schoenaert's at his most effective when playing brooding hulks whom we're not sure whether we should be sympathetic towards (Rust & Bone, Bullhead). Winocour exploits his strengths here; his Vincent is a bit of a slimeball when you get down to it, but there's something in Schoenaerts' puppy dog eyes that lets us give him the benefit of the doubt. Vincent's hearing condition allows Winocour to exploit her film's sound design to great effect, switching between his good and bad ears to catch snippets of illicit conversations while assaulting us with feedback - think The Conversation if Gene Hackman's surveillance equipment was built into his head. The soundscape bleeds in and out of a thumping electronic score by DJ Gesaffelstein, adding to the tension and paranoia created by the director's skillful use of tight frames. The explosive bursts of action are handled with similar aplomb, reminiscent of the early work of Luc Besson. If Disney paid attention to world cinema, Winocour would no doubt find herself offered a Marvel movie. 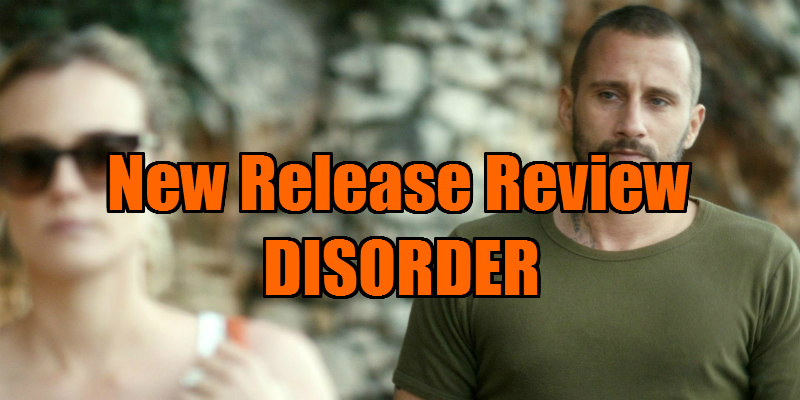 Some viewers may find Disorder's basic plot off-putting, but the lack of details offered is a conscious decision to reflect Vincent's point of view - the motivations of Jessie's would be abductors are of no interest to him; he simply wants to protect the object of his obsession. Winocour's disdain for plot in favour of tension (much of it sexual) and atmosphere building is refreshing, particularly when so deftly handled. This is a filmmaker of abundant potential.